​The much anticipated £130m M6 Link Road officially opened on Monday 31st October. The scheme, which has been under construction since 2014, will connect the Heysham peninsula directly to the M6, providing better access to Morecambe and industrial areas that include the Port of Heysham and the Heysham power stations. 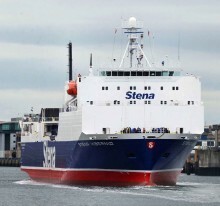 Stena Line has confirmed it will be adding extra freight capacity to its Belfast-Liverpool service. TheStena Hibernia will be introduced onto the route from Tuesday 5thNovember and will initially operate eight sailings per week giving freight customers greater availability and choice. The extra sailings will depart Liverpool Tues – Fri at 0300hrs and will depart Belfast Tues – Fri at 1500hrs. Passenger figures rise 9% and freight 60% in first year of service ON the 21st November 2011, Stena Line began services on its new Belfast- Cairnryan route by introducing two of the largest ferries ever to sail between Northern Ireland and Scotland.